We are the sole dealer 'BAUM' brand hand tools which is one of the leading, growing world class. Lifetime guarantee on Hand Tools. Our company has achieved widespread recognition in providing Stainless Steel Wrench. We are an accomplished name in the field of production of Metal Ratchets .Our organization provides slim head and handles which are easy to maintain. These Metal Ratchets are highly efficient in working. Our company also provides our clients with reversible Metal Ratchets, thereby showing high level of performance in operation. In order to keep pace with never ending demands of the customers, our company is instrumental in offering Basin Wrench. 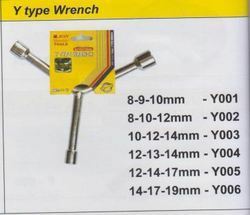 We can supply the best quality Wrenches.